The Liquid Containment Fuel Bladder is a clever and very effective method of increasing your off road fuel capacity without investing in a bigger tank. 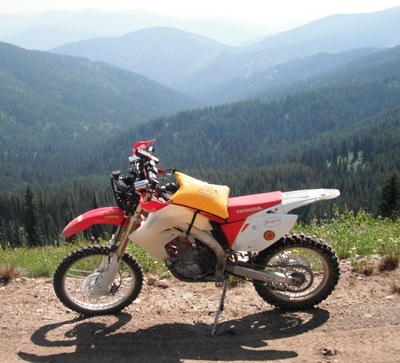 Having ridden with a variety of Acerbis and IMS desert tanks on various dirt bikes we are convinced that anything above five gallons is just too big and unwieldy for general riding. Enter the collapsible fuel bladder which may be rigged and carried in a variety of ways full, then rolled up and stored neat when empty. It's just the ticket. Liquid Containment is an Australian outfit that manufactures a variety of flexible liquid containment solutions for water, fuel, etc., in all sizes and shapes. We ordered up the 2.1 gallon fuel bladder, shown above, from JustGasTanks and it arrived just a couple of days later. We have to commend the folks at JustGasTanks for knowing how to do e-commerce right as theirs is one of the most user-friendly and painless sites on the web to navigate and order from. Shipping was extremely fast. Salute! The Liquid Containment Fuel Bladder is very rugged. It comes with enough attachment points to provide plenty of mounting options. After about a half hour of fiddling around we eventually determined that the method that worked best for us was to sling it around our neck with a piece of 1" webbing and let it ride on the seat right in front of us. You're doing squats with an additional 14 lbs. every time you stand on the pegs - but hopefully this isn't for long. We've also had excellent luck strapping it to our fuel tanks and mounting it on our handlebars. 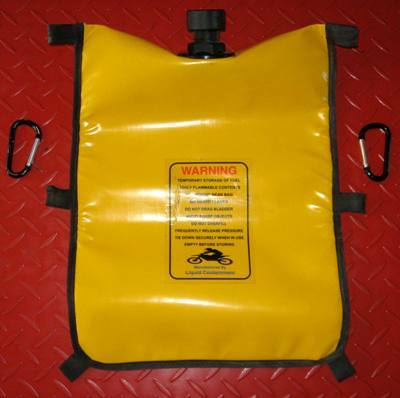 Everything about the Liquid Containment Fuel Bladder exudes durability and quality. The urethane material that comprises the bulk of the bladder appears virtually indestructible and all of the seams appear to be bulletproof as well. The filler cap is absolutely liquid and vapor tight. There is no gasoline odor apparent after the filler cap is sealed to the bladder and none becomes apparent even after miles of bouncing over rough terrain. Our has survived multiple crashes and get-offs with nary a leak. Price Paid: $124.99 (2.1 Gallon size) - JustGasTanks (carabiners not included). Other sizes are available. The Good: Easy to rig, easy to store. The Rad: Less expensive (and less bulky) than a larger tank. The Gnarly: Goodness gracious, great balls 'o fire!